I nod. Usually this means cameras show up to my workplace and I talk for a few minutes: how long I’ve been here, how much I like it, isn’t the weather nice? Why yes, it is. Astana is a beautiful city. It has grown so much. I love the wide avenues, the parks, the tall buildings. I wish the best to all the people of Kazakhstan on the 15th anniversary of their capital’s founding. As I’m running between my two libraries the next day, tall girls with elegant brown hair stop me in the school hallway. The older one holds a stack of papers and pauses to assess my teacher-clothing: a long summer skirt and blue V-neck. “You can’t wear blue. Blue is our producer’s color,” she says, diplomatically. Dayana* says her driver will take me home to change. 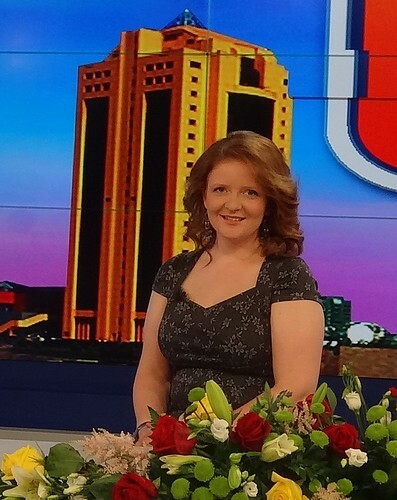 Dayana studied in Pavlodar, but has worked in the TV center for a few years. 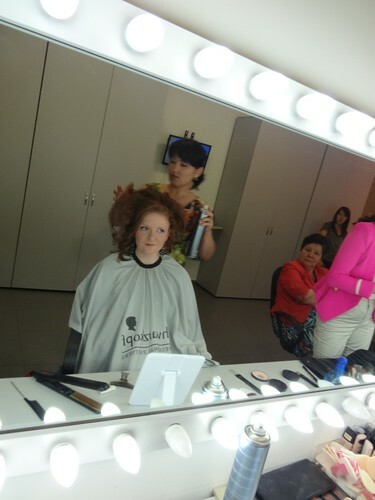 She does ‘paperwork’… which apparently includes helping foreigners learn what to wear on TV. Her young companion is an intern from a local university. As we leave the school, I look around at the fledgling green trees, the broad construction panels, the shimmering bright heat and luxury cars of the parents who are at the school for commencement. It’s Saturday. “Do you work every day of the week?” I ask her, realizing this isn’t a workday. Of course. Stopping by my house to select a gray dress, the driver takes us across the Rams Bridge to Newtown, the Ishim River curving broadly to our right. Dayana hands me her script for the broadcast, topic-by-topic laid out for the newscasters, with open questions for the various guests. When we come to the giant television complex at KazMedia, we go straight to the production floor. A maze of narrow corridors leads past small offices where men sit at computer monitors. 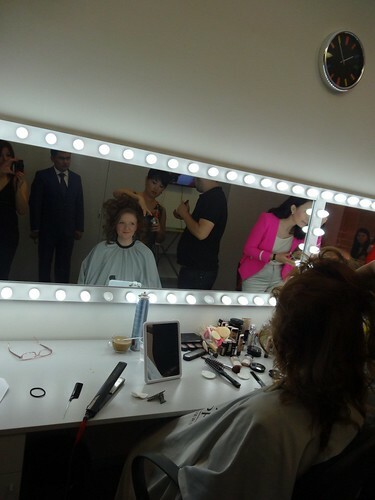 Then, in a bright room with makeup mirrors, a man seats me down and begins to work. He uses a palette of foundation and a thick brush of paint to flatten out the face, a dusting of dark red blush and powder. Koz jaubiniz, he says, and begins to work dark oily paint over the eyelids. His warm hands smell like cigarettes. To his side, a woman takes hold of my hair, pulling it into sections, curling it, teasing it down into tangles with a narrow comb, and curling it again. She smooths everything into a giant bouffant, cool manicured fingers tucking each strand in order and sealing it with a giant bottle of hairspray. It’s almost time, someone behind her urges, schedule, production, and the Producer comes in to observe, reviewing his script while a man dabs his makeup. In the corner I hear other guests murmuring – who is she? “She speaks Kazakh,” Dayana whispers. Which seems to suffice. I’m invited to the production studio, where I see a stage, three fuzzy figures behind a white countertop (my glasses were quarantined in the makeup room), a flash of colors that may be flowers, bright digital displays. In the dark foreground of the room, men wait and tuck themselves around boom mikes in the shade, a black camera that runs on a track, dimmed soundboards and displays. But as I walk forth, the haze clears into a familiar slim woman in pink blazer – I’ve seen her often on the nightly news before. The producer (?) sits in his proprietary blue jacket, and a Turkish guest sits at my left, a portly journalist skilled in five languages, including the Kazakh he displays with televised ease. As the segment begins, I’m asked to turn towards the center; I can only see the newscasters as they reads from the teleprompters in the dark before us, those thick screens of white words on black. For every pause or slidden word, the Newscasters quickly shake their heads and begin again, at a lively clip. Twice, the woman inclines her head, nodding. She listens through an invisible transmitter and adjusts her voice. 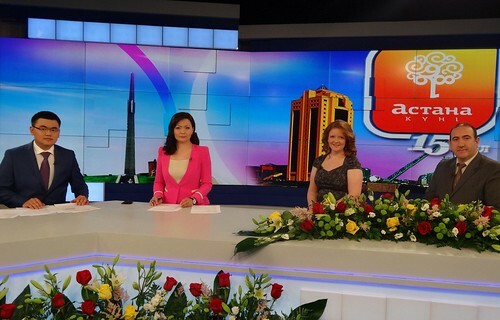 Our two-minute segment is scheduled for the city’s birthday, so we spend at least fifteen talking about how we like Astana. I’ve practiced all these beautiful phrases about ademi sayazhailar zhasalip zhatir and asem, ademi kalasi — but I forget it all in front of the glassy white surface, the dark cameras and the professionals. The Turkish journalist fills in any gaps I care to leave open. They ask us to compare private to state schools – touchy! – and I try to compliment both while noting our international curriculum. The Journalist and I would both love to stay in Kazakhstan, we say, and give our blessings to the city – tuul merekesi kutti bolsyn, halki bakytti bolsyn! Then we shake hands with the newscasters – again, no smiles cracked – and they go on to record their next session, as we’re off and away into the summer heat. And this is the thing – I love to see how people work, all over society and all over an organization. Having worked in a school this year, I’ve gotten to learn so much about teaching and educational admin. Last year at the university, before that at a bank. And whether this segment makes it fully to TV (scheduled in 2 weeks’ time), I’m glad to have glimpsed how a news show is prepared. 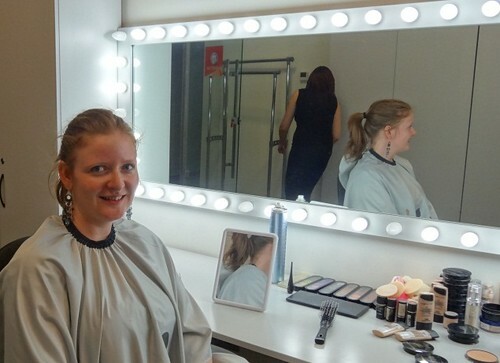 I’d love to see more workplaces in the future… although my personal career options may be limited by this new desire to have a full-time makeup team on hand! Thanks, guys! I wish my Kazakh resume were a little more transferable worldwide 😛 and I did enjoy both the scary hair and the resulting hair.